Can you pick up Jupiter’s moons with an old digital bridge camera? 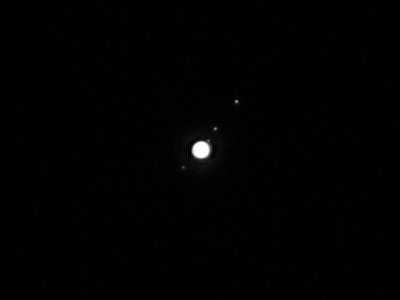 It turns out you can: this is a 100% crop of an 8 megapixel image from my Canon Powershot S5 at 12x zoom – while the camera is not able pick up details from Jupiter’s cloud bands, all four galilean moons are distinctly visible here. It’s by no means a pretty shot, but it’s still amazing that it’s possible at all – this is another planet in our solar system with its moons! This was photographed on January 12th at about 19:00 CET.